Over the years I have read plenty of books about America. Some of them funny and light, some heavy and geeky volumes about niche subjects. Some great, some not so good. But recently I just finished one of the best volumes I have ever read about travels in the US. 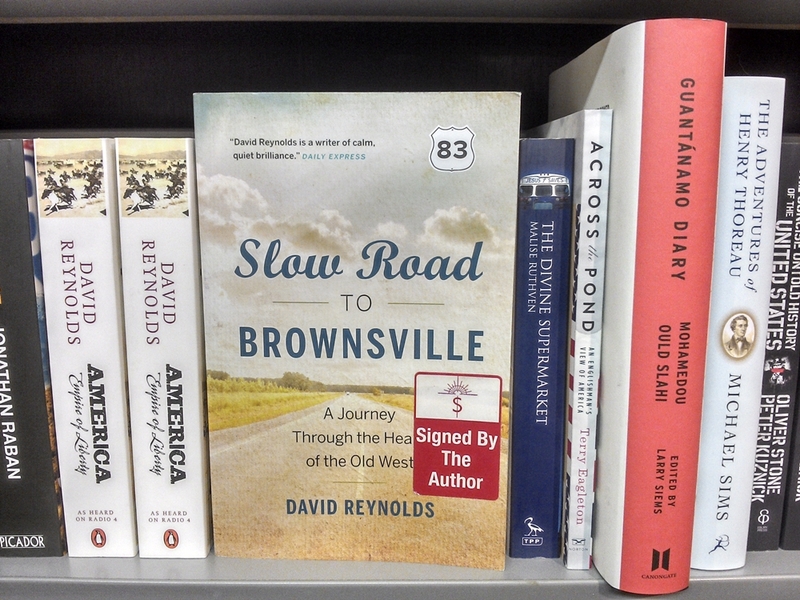 Slow Road to Brownsville : A Journey Through the Heart of the Old West by David Reynolds is a classic travelogue describing his journey along Hwy 83, all the way from Manitoba to Brownsville on the Texas – Mexico border. The author starts from the northern end of Hwy 83 in the small community of Swan River located in the Canadian province of Manitoba, 400 km north of the US border. He chose it as a starting point because of the connection of this place with his father who emigrated there when David was young. From there he slowly moves south through the Canadian and American Great Plains all the way to the Rio Grande. Over the thousands of miles he drives Davis meets locals, visits small towns and local tourist attractions like historic forts or state parks. He drinks in local bars and sleeps in cheap motels, often run by people with an Indian background (I mean from the Indian Subcontinent rather than Native Americans). His clear objective is to drive every single mile of Hwy 83 but he allows himself to venture off to see the nearby sights as long as he doesn’t go more than 90 miles from the 83 and returns to the same spot where he left it before continuing further south. I absolutely enjoyed this book and for a few reasons. First, Reynolds writes very well, in clear, short and crisp sentences. His style is very descriptive as he explains precisely how the people he met were dressed, what cars they drove, what colour was his bed in the local motel, how the tap was leaking, how fat some people were etc. I could basically see what he was writing about in front of my eyes. Here we come to the second reason why I really loved this book. It is easy for me to imagine what he writes about as he describes one of my favourite regions in America, the Great Plains. 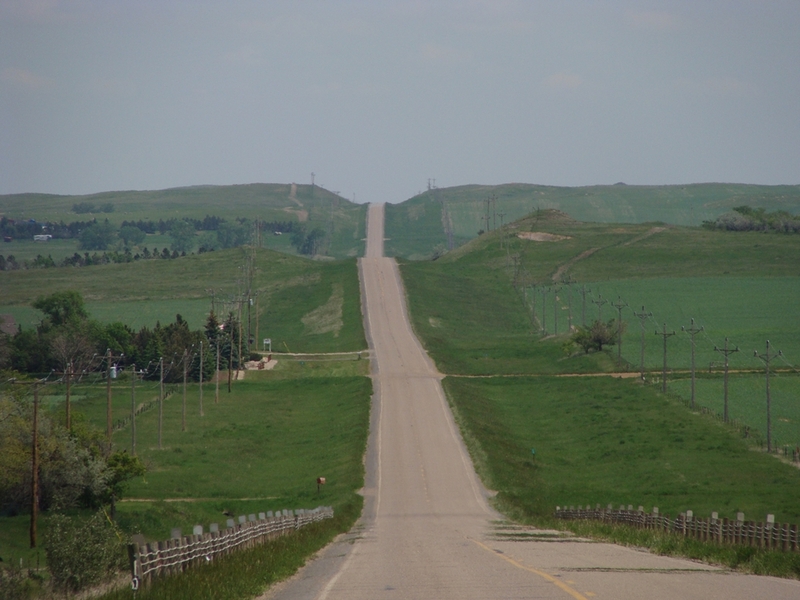 Hwy 83 runs quite close to the 100th meridian west, which historicaly represented the rough bounduary between eastern and western USA, between farming and ranching, and between humid and semi-arid climates. Those open speces in the middle of the continent are also my favourite places to roam around. In fact during my various trips I have visited quite a few places which Raynolds is writing about. As I was mostly traveling from east to west (or vice versa) rather than longitudinaly, as the author, my routes crossed with his in a few places only. Bismarck in North Dakota, Badlands National Park and Walls in South Dakota, Sand Hills of Nebraska, Dodge City in Kansas, Shamrock and San Antionio in Texas, that’s where our paths crossed. It is really fun to read about places I have visted, especially when the author’s impressions are similiar to mine. And here is the third, and probably the most important, reason why I love this book. Basically it seems that the author’s ideas, impressions and feelings during his road trip are quite close to mine. Sure, there are differences. For example he seems to be more surprised by some things than myself, but that might be due to the fact that I have roadtripped in the US quite a lot. Then, he prefers slow driving, I like speed. And most importantly, I would never drive a Toyota Prius across the Grat Plains. It is like ordering Coors Light in a London pub. Abnomination! Give me a Ford Mustang or Chevy Camaro, even a pick-up truck. But our broad reflections seem to be quite similiar, even if there is a good 25 years between me and the author. Regardless of the fact that untill the age of 12 I lived behind the Iron Curtain I share Reynolds’ recollections of how US cinema created an image of the country long before any of us ever set a foot there. He was fascinated by westerns, I preferred crime dramas or road movies. Like Conwoy from 1978 starring Kris Kristofferson or Smokey and the Bandit from 1977 starring Burt Reynolds and featuring the East Bound and Down song, still one of the best driving tunes. Reynolds was playing with plastic figurines of cowboys and Indians while I was dreaming about big eighteen wheelers and fast cars. It seems that for both of us driving empty roads of the Great Plains brings countless memories of childhood plays and cinematic excitement. It also looks that for background Reynolds read a lot of the same books that I did. Grapes of Wrath and Travels with Charley by John Stainbeck, Great Plains by Ian Frazier, Bad Land by Jonathan Raban, On the Road by Jack Kerouac are only a few titles he mentions and which I also read. A trip across those central states is more than just a physical movement from point A to point B. It is usually travel through preconceptions, with familiar iconinc landscapes rolling by and Reynolds describes this feeling very well. I wish I could do it as well as him. I can recomend this book to anyone interested in real America, places far from the sophistication of the New York City, or the glamour of Hollywood or the tropocal paradise of coastal Florida. It is also a great travelogue, easilly in the same league with Steinbeck’s Travels with Charley, another book which I might write about soon. This entry was posted in Uncategorized and tagged book review, Hwy 83, Slow Road to Brownsville : A Journey Through the Heart of the Old West on June 16, 2015 by admin.